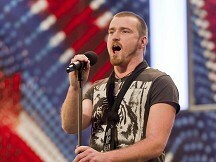 Britain's Got Talent winner Jai McDowall wants focus on his singing career before looking for a girlfriend, he has said. The 24-year-old, who was wracked by nerves during the competition, said he is now feeling unusually "dead calm". And the shock winner had high praise for young favourite Ronan Parke, who he described as an "absolute wee gentleman". Speaking in central London wearing a denim jacket and jeans, he said: "I'm actually single at the moment. To be honest, at this point in time I need to focus on what is going to happen next and where my career is going to take me. Maybe after I'm a wee bit more settled I'll start looking, I guess." With a touch of embarrassment, the quietly spoken Scot added: "Yeah, we'll see what happens, we'll see what happens." Parke, 12, from Norwich, hit the headlines after an anonymous internet blogger alleged Cowell had been grooming him for stardom for the past two years. The pop mogul called in the police, saying the allegations were "complete and utter lies" while Parke himself dismissed the blog as "really silly". But McDowall said: "I didn't really take much notice of the papers during the last few days. I've just been focused on trying to get my performances right and pretty much living in my own little world. (Parke) seemed absolutely fine. He took it in his stride. He's an absolute wee gentleman and I wish him all the best for whatever comes his way." Asked if he was hurt by suggestions Parke was robbed of victory, he said: "No not really. People have their own opinions. Some people are going to like Ronan better and some people are going to like what I do better. That's absolutely understandable. That's part of life, you just have to get on with it." And he had no hard feelings towards Cowell, who praised his performance but went on to describe the vocal as "a little bit monotone". He said: "I took the comment on board and luckily enough I was able to sing the song again after winning. I spoke to Simon again later on and he said the difference between the two performances was night and day. McDowall will use the £100,000 prize money to pay off his mortgage and decorate his house and is looking forward to performing in front of the Queen at the Royal Variety Performance. He said: "Winning this competition is going to be completely life changing. The £100,000 is going to buy my house for me and make me financially secure for the rest of my days. To sing in front of the Queen is just an honour. A boy from where I come from - we don't dream about it, it's absolutely amazing." Tinie Tempah is set to play in Belfast's Custom House Square this summer as part of the city's Belsonic festival. Former Downing Street director of communications Alastair Campbell has labelled an on-the-pitch "tussle" with a boyband member as "all a bit handbags". Lady Gaga held onto the top spot in the charts this week, with her album Born This Way remaining at number one for a second week. Cheryl Cole will be a judge on American X Factor if Simon Cowell "has his way", the music mogul's spokesman said. A West Point cadet is suing veteran R&B diva Patti LaBelle, accusing her of ordering her bodyguards to beat him up outside an airport terminal in Houston, Texas. Coldplay fans waiting to hear the band's first single for two years were treated to a repeat performance when Radio 1 DJ Fearne Cotton played it twice, back to back.